Syria's exiled Muslim Brotherhood offshoot called on Syrians to take to the streets to demand freedo.. 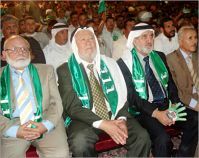 The Islamic Action Front the Muslim Brotherhood’s political arm in Jordan has called on Syria’s .. The Muslim Brotherhood (MB) in Syria issued a statement condemning and denouncing the genocide commi..
Rashid commended the comprehensive reforms which were announced on March 9 including greater indepen..